Great news! The Refueling Station by Daily Harvest pop-up opens to the public in New York City. This is the first-ever IRL experience from Daily Harvest – the direct-to-consumer brand that delivers chef-crafted, organic, plant-based food that nourishes at the speed of life. They’re busier than ever, and we know that being on-the-go can lead to quick, unhealthy food choices – from convenience stores to gas stations and urban bodegas. That’s why Daily Harvest created the Refueling Station as a food oasis for busy New Yorkers to disrupt their overbooked schedules and remind them that they can nourish their bodies with good food that won’t slow them down. 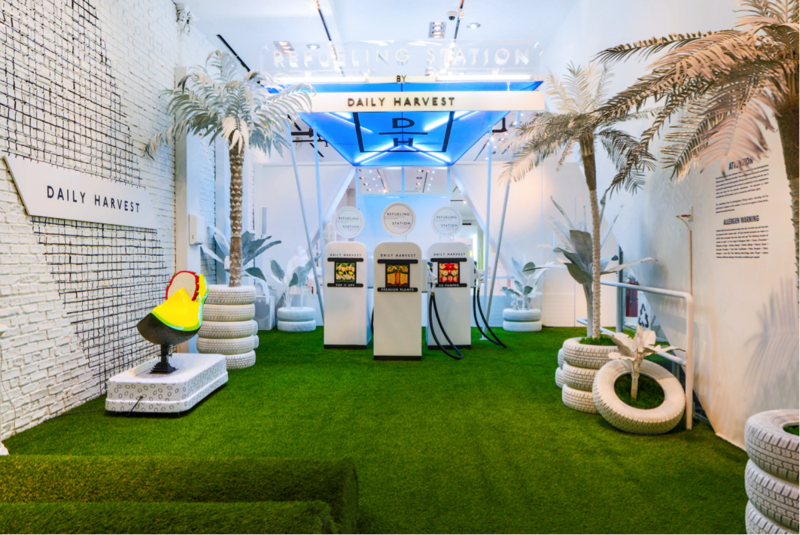 The pop-up’s chic take on a retro gas station is a physical manifestation of Daily Harvest’s greater mission to take care of food, so food can take care of you. Daily Harvest samples, including smoothies from the Full-Service Pumps and an interactive Car Wash serving full-sized breakfast bowls, harvest bowls, smoothies and more. Functional lattes and fresh-baked, plant-based cookies will be served from 3-4pm daily for the perfect afternoon pick-me-up. The ‘Cado Car is Daily Harvest’s Superfood spin on the nostalgic coin ride. A freezer aisle, which has been reimagined into an interactive photo moment that allows guests to actually step inside the freezer and be transported to different agricultural terrains where Daily Harvest organic produce and Superfood ingredients are sourced. Swag giveaways, select cups available for purchase on-site and other surprises!